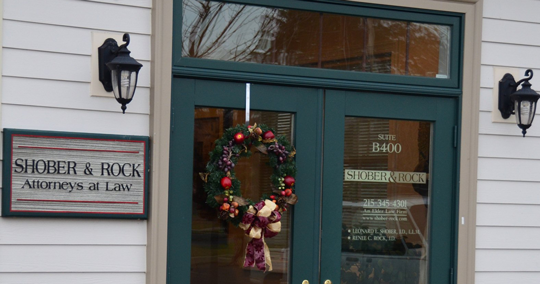 Shober & Rock, P.C is a Bucks County law firm devoted to the legal issues affecting the elderly and disabled. These legal services are often referred to as “elder law.” The practice of elder law encompasses a wide range of legal issues and specialties that are of particular importance to the elderly and infirmed. Are You Looking For An Elder Care Attorney In Doylestown PA? Do You Need An Elder Abuse Lawyer To Help With Your Your Loved Ones Case? We Have 30 Years Experience In Elder Law and Estate Planning In Montgomery and Bucks County PA.
Leonard L. Shober has focused a quarter century on representing clients in their estates and tax matters. He began his legal career in an estate planning practice. Renee C. Rock is an attorney and partner in the Shober & Rock law firm where she focuses her practice on estate administration, estate planning and elder law. Pat joined Shober & Rock in 2006 as a paralegal. Pat previously worked in various areas of the law including law firms and the Bucks County Bar Association. Alice joined Shober & Rock in 2004 as an Estates and Trust paralegal.